· It uses a cartridge-free technology that eliminates bulky plastic cartridges. · The solid ink sticks are non-toxic, clean and can be loaded into the printer on the fly. 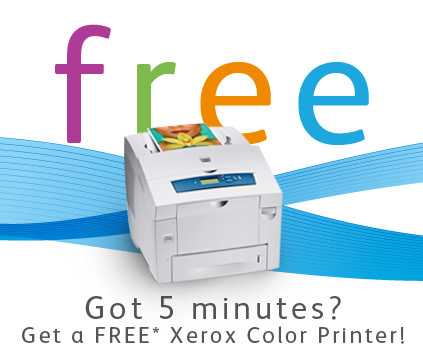 · The printer is free – all they ask is you print 2,000 color pages a month. 1. A business established for 2 or more years – if in business less than 2 years, owner(s) credit info required. 2. A good credit history and credit score. 3. Minimum of 2,000 color pages a month at 12 cents a page or $240 a month. All black pages are billed @ 2.2 cents a page. 4. Xerox PagePack software needs to be installed on PC with 24/7 connection to printer and internet – sends monthly page usage to Xerox for billing. They are happy to approve home businesses. After 36 months the printer is yours to keep. It is structured around a lease, so you cannot opt out of this program once in. FREE GreenPrint software to reduce wasted pages – saves you additional money! If you are like many small and home based businesses not generating 2,000 color pages a month, there are 2 other units that will work for you. The Xerox Phaser 8560 is great for those printing around 1,000 color pages a month and the Phaser 6180MFP is a great fit for small offices looking for a fully functional all-in-on color laser printer. For more information on any of the printers, please contact me or click here to sign up for your free color printer today. There is no commitment to buy.